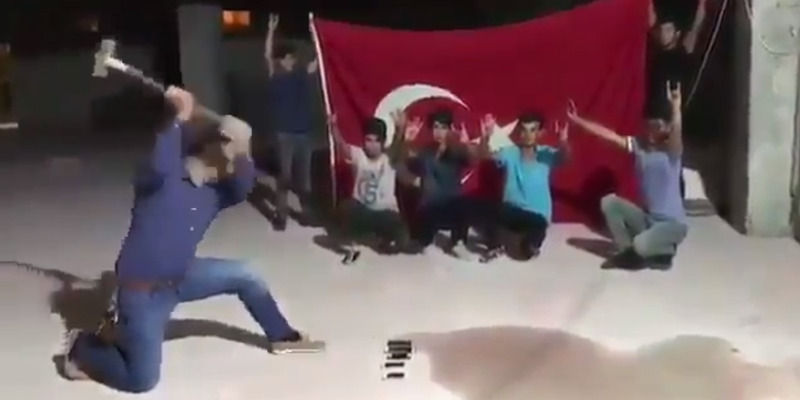 Screenshot/TwitterThis video of a Turkish man smashing an iPhone has gone viral on social media. Several Turks on social media protested US sanctions and the country’s plunging currency by smashing their iPhones and chopping up US dollars. The trend appears to have started on Wednesday, after a video of a man obliterating five iPhones with a sledgehammer went viral. Turkish President Recep Tayyip Erdogan called for the boycott of US electronics, including the iPhone, on Tuesday. This week, the Turkish lira saw a dramatic drop but bounced back on Wednesday. Several Turks on social media protested US sanctions and the country’s plunging currency by smashing their iPhones and cutting up US dollars. The trend appears to have begun on Wednesday, after a video of a man obliterating five iPhones with a sledgehammer went viral. “This one is for Reis [chief],” the man says, referring to a nickname used by supporters of Turkish President Recep Tayyip Erdogan. Four of his accomplices hand over their iPhones and shout “Allahu Akbar” (God is great) before the devices get pounded to bits. Several protesters got creative with their choice of tools when bashing their iPhones – some used bricks, others lit their phones on fire. In another video, Turkish lawmaker Cemal Enginyurt from the country’s Nationalist Movement Party bought a Samsung phone and asked a colleague to throw his old iPhone on the floor and crush it. People have also been filmed cutting up US dollar bills. Erdogan first called for the boycott of US electronics, including the iPhone, on Tuesday, in defiant response to US slapping sanctions on two top Turkish officials. The US also raised tariffs on Turkish metal exports. “If they have iPhones, the other side has Samsung. In our country there is Venus, Vestel,” Erdogan said. The Turkish lira saw a dramatic fall following the measures, plunging as much as 20% versus the dollar in an all-time low last week. The lira’s decline was felt globally, leading to drops in other emerging market currencies. Turkey’s currency bounced back 7% on Wednesday after Turkey slapped huge tariffs on American cars, alcohol, and tobacco.